But I think it would fall apart if I actually wore it as often as I feel it. Instead I wore it to trivia night last night to intimidate all the geeks and hipsters. We came in 2nd place. 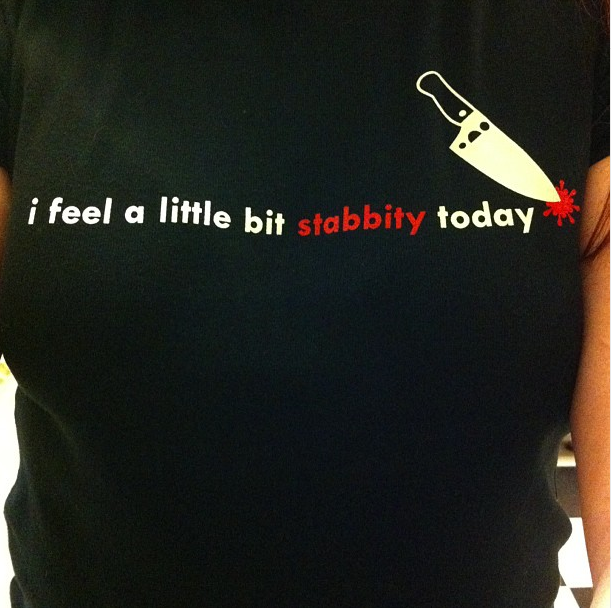 My Stabbity tee is via Kawaii Not. Snark in comic form = Love! My Tabitha Simmons for JCrew mary janes finally arrived! The fabrics are even more adorable in person and I love the graphic pop of the navy edging and sweet little button. The construction feels pretty solid, although I'd like to compare them to one of the original silk pairs from Tabitha's line. They started this collection at size 6 so they are a bit big on me but it probably helps because, as always with mid-shoe strap mary janes, the strap presses a bit on the top of my foot due to my high arch. But overall they've been comfortable to wear and walk in. I love the two floral prints. They will be perfect to pair up to a solid dress or one with a bolder pattern. I'm wearing them today with a navy cardigan and pencil skirt so the piping really pops. 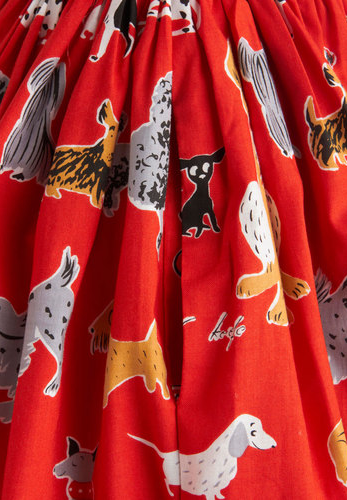 The mary janes are my favorite style from the collection and it's so fun that they pulled in their other collaboration - Liberty - for the fabrics. A sweet summer heel that makes me want to wear rose water perfume. It's determined to not let me get any good outfit shots. That's what you get with an old house that isn't well lit. But you can sort of make out that I'm wearing a white JCrew button-down, white brown belt and khaki pencil skirt. Paired with a pair from way back - Ralph Lauren wingtip cap-toe slingbacks. I do love these. I've always thought they were so classy. It hasn't been too horribly warm here yet, so I'm enjoying actually being comfortable outside. 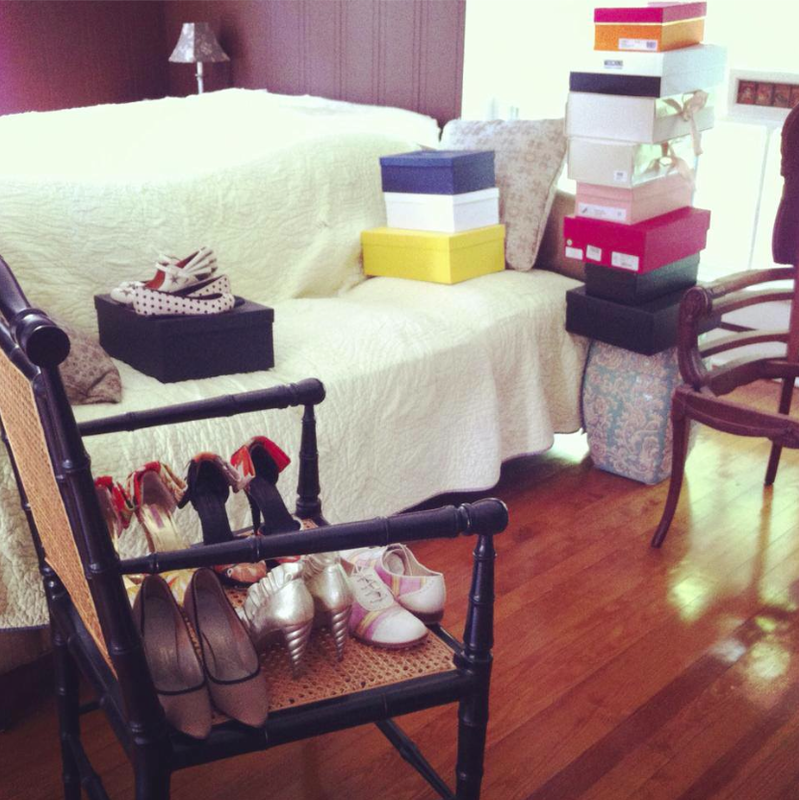 I have a storage box in my bedroom that I like to think of as the "Staging Area". It's were new shoes sit until they get worn and have a place in the closet or Shoe Cabinets. I had quite a number off boxes stacking up and something had to be done. So I descended into chaos over the weekend. It took most of the day. 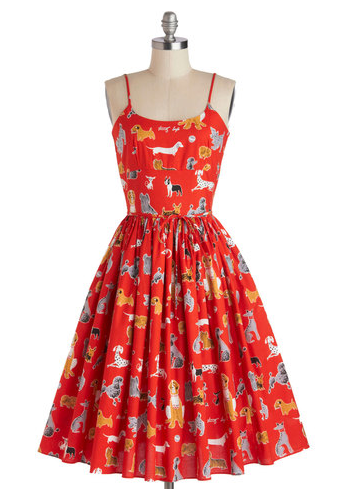 And not just because I kept trying on old favorites. 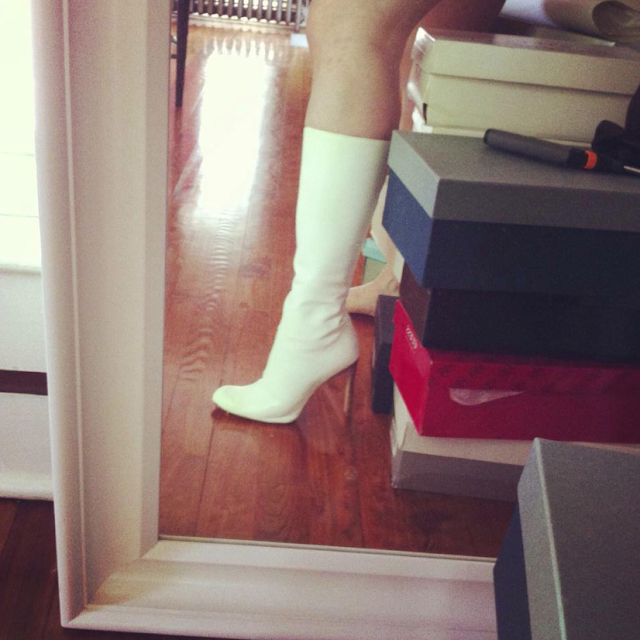 I ended up keeping these BeBe boots. A wee bit snug but snazzy. I love swinging the doors open and picking out a pair to wear. Plus they do a great job keeping the dust off but still having a larger percentage of my shoes visible. It finally hit some real summer heat here today and just now a huge thunderstorm has rolled through. Because it was so warm (I had I just given myself a fresh pedicure with dark red polish), I slipped on a favorite pair of Jimmy Choo sandals from... oh.... 6 years ago? 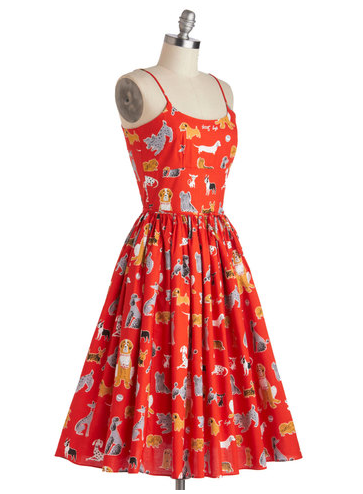 I paired this with dark red skirt and dark khaki top and jewelry in gold, opals and rubies. I started thinking about how much I like this sometimes tricky combo. 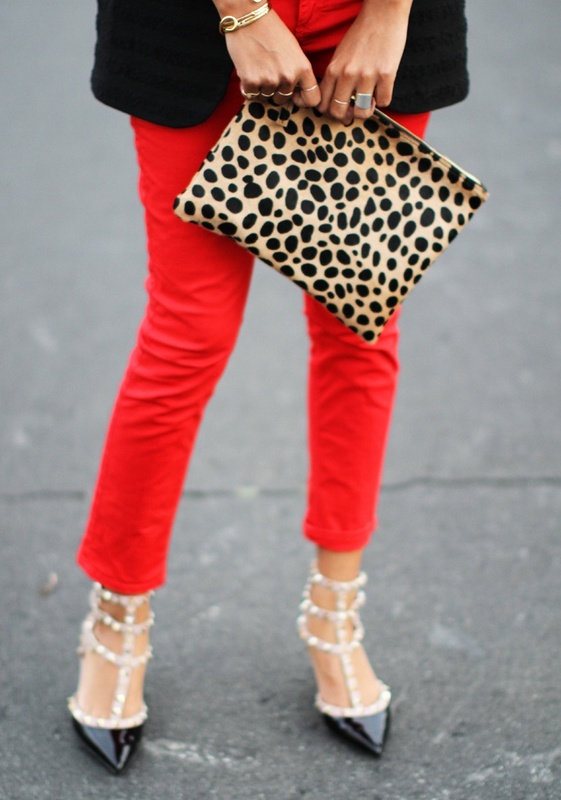 Case in point - a winter version with a red sweater leopard skirt and red Rockstuds. I have a vintage leopard coat. I think I need some red pants to go with it. I love the wellies combo too! I currently have it in my head that I need a wardrobe of classic t-strap pumps. What I didn't realize is how challenging it was going to be to find t-straps with all of my criterial. Closed-toe, high-heeled, not chunky, thin straps, almond toe and un-embellished. I want something classic and elegant and powerful. The closest I've found thus far are these Gucci pumps. Luckily they have them in 5 colors - black, red, blue, olive green and beige. There is also a lovely tweed version. They might be a bit pointier than I would like. It's hard to say. Oh yeah and they're $695. I'll have to keep searching, I guess. So I just spent a quick two days and two nights in New York for work. I only had time to eat dinner out and be in meetings. On Tuesday night I did get to meet up with the lovely Midtown Girl but I have to photographic evidence. We are bad bloggers, being more interested in our drinks and chit chat than in documenting. Since I don't have any great photos and I didn't even get to pop into my favorite, Bergdorfs, I wanted to share this great archival footage of 1939 New York. It's so colorful, I just love it. I need a longer trip in the city. 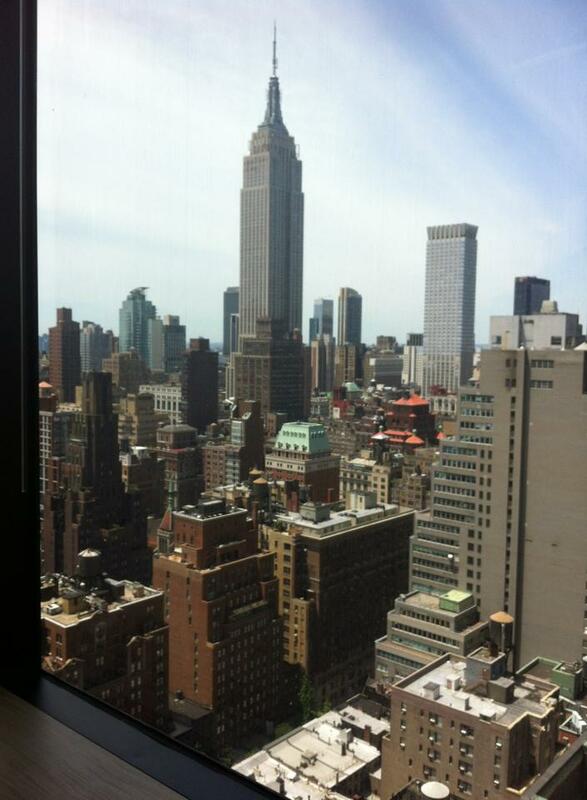 These 48 hour work trips are much less fun! Lots more traveling going on this week! I loved the Graceful Greenery dress from ModCloth so much that when it came out in another print (and adorable one too! ), I had to nab it. 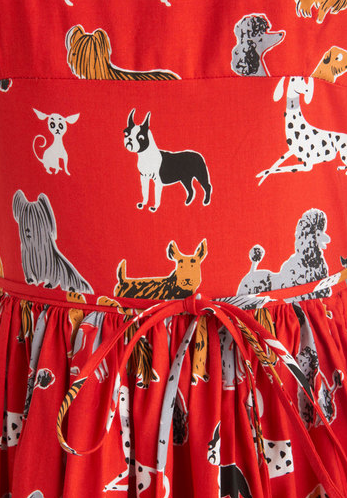 How fun is this Dog Park print??? I also got the black and red clear Bass x Antonoff Maebird oxfords. I will be making an outfit post very, very soon!